Turn off all automated text message and email notifications for your customer. You can turn off notifications for a customer if you no longer want them to receive any automated emails or texts. You can see if a customer's notification settings are on or off in the Contact Info section. 4. In the 'Edit contact info' pop up, check the box next to 'Receive Notifications' in the bottom left corner. You can confirm that notifications have been turned off by looking in the contact info section. You cannot turn off all customer notifications at once, it must be done individually. 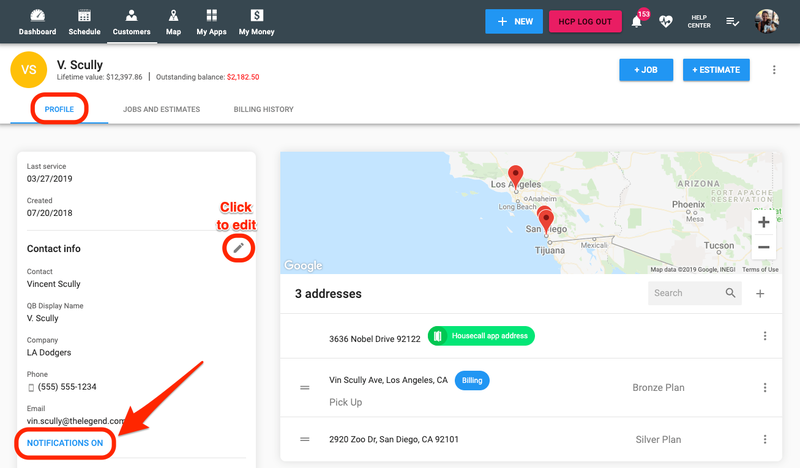 Although your customers will no longer receive messages automatically, you are still able to manually send scheduling confirmations, invoices and receipts. Just keep an eye out for the 'Notify customer' option (see below). What job notifications will my customers receive? How do I customize SMS notifications? What do the email reminders look like for my customer?